When you go to a circle you may be required to sit or lay on the floor so it is always good to be dressed comfortably. They usually last from one hour to one hour and a half if there is a big group. Many times the practitioner utilizes different meditation styles to help induce clients into a meditative state which aids the Reiki part as the participant's body will be relaxed while receiving Reiki. The practitioner will work around your body so you may feel a sense of warmness or coldness in different areas while the practitioner guides the Reiki through your main chakras. After the Reiki, usually, practitioners help ground participants by guiding them into sensing their body or engaging them in a breathing or specific movements of the body. This is important because when you are receiving Reiki in a meditative state of mind, usually we feel elevated as many times our minds may travel. Other times emotional or energetic releases are experiences which may require more time to fully feel grounded. In other words, expect to feel lighter, more balanced, and very relaxed after the circle. Reiki is a daily practice for Reiki practitioners and people interested in keeping a healthy and well-balanced life may attend to as many Reiki Healing Circles as they want. The cost of a Reiki Healing Circles varies... If you go to a yoga studio or a gym, the cost of this circle may be included as part of membership. If you go to a site or agency, the practitioner may have a fee of $5-30. New practitioners some times offer free classes in exchange for a love donation to acquire practice. Nowadays, Reiki Healing Circles are becoming more and more popular. You can find Reiki Healing Circles in your neighborhood by searching on the internet or asking at your local gym or yoga studio. 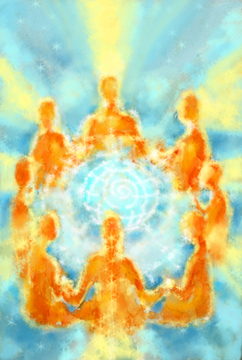 Spiritual shops and metaphysical shops sometimes offer Reiki Healing Circles weekly or twice per month. I invite you if you are in the Miami, FL area to attend one of my Reiki Healing Circles! For more information about what I do and where I offer Reiki Healing Circles, please visit www.thezenwave.com.